Even with the roomiest of vehicles, packing the car for a long trip can quickly turn into a frustrating game of Tetris. CURT cargo carriers are a simple yet effective solution for maximizing the storage area of your vehicle. 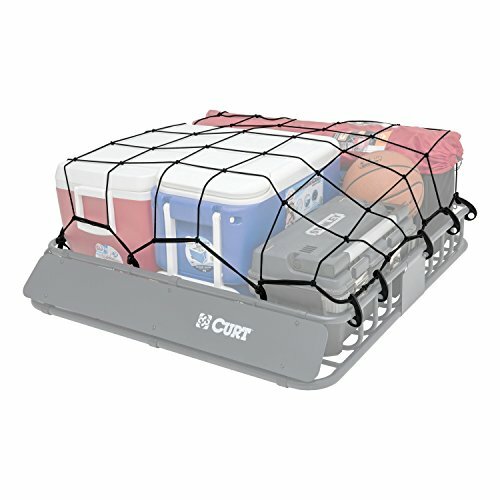 CURT cargo carrier nets are the simple, effective way to secure your cargo. Using a series of ropes or bungees to keep your cargo in place isn't always effective. Ropes can be a nuisance to unravel and remove from your trailer, while bungees can be unreliable.CURT cargo carrier nets combine the convenience of a bungee cord with the effectiveness of a rope. Our cargo nets feature a series of hooks that latch onto your cargo carrier and provide a taut netting across your items. This cargo net measures 65" x 38" and is designed to fit over the CURT roof rack cargo carrier (without extension). Whether you prefer the hitch-mounted carrier or the roof rack option, CURT has cargo management solutions to meet your needs.